Most banks have reported huge profits for 2018. 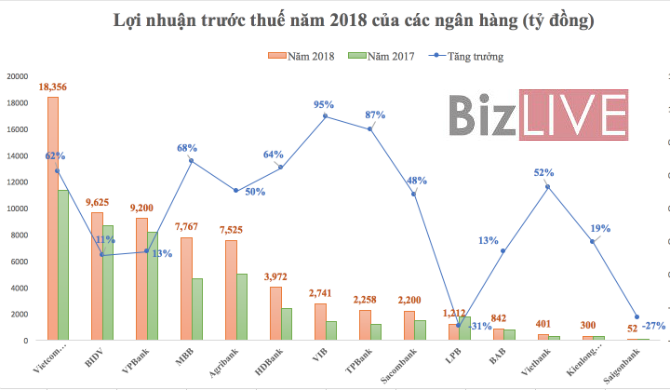 VIB Bank led banks with the highest growth rate of 95 percent, while Vietcombank had the highest profit of VND18.356 trillion in 2018. Despite the credit growth slowdown in 2018, banks still had a prosperous year. Many banks reported growth rates of over 50 percent compared with 2017. TP Bank reported a growth rate of 87 percent, MBB 68 percent, HD Bank 64 percent, Vietcombank 62 percent, VietinBank 52 percent, Agribank 50 percent and Sacombank 48 percent. Of these banks, Vietcombank’s profits far exceeded the next bank, VND18.356 trillion vs VND9.5 trillion. According to the State Bank of Vietnam (SBV), the credit growth rate of the entire banking system in 2018 was 14 percent, the lowest in the last four years. However, the system still could make positive contributions to GDP. Regarding the credit scale, VND7,420,000 trillion worth of loans was pumped into the national economy, equal to 134 percent of GDP. Bank shares had a big impact on the stock market with VCB, BID and TCB making up 15 percent of the market capitalization value. The shares are also among the companies with biggest capitalization value in the market. VCB, BID, TCB, MBB and STB have had the largest trading volumes on the HCMC bourse many times. Le Xuan Nghia, former deputy chair of the National Financial Supervision Council, said that Vietnamese banks’ profitability has improved considerably, reaching the average level of Southeast Asia with the ROA doubling that of 2011. The average ROA rose from 0.56 percent in 2011 to 1 percent in 2018, while ROE rose from 6 percent in 2011 to 14 percent. 2018 was the best performing year for Vietnam’s banks since the global financial crisis in 2008-2009. The central bank was determined to curb the credit growth rate at 14 percent in 2018, lower than that of previous years. This showed the government’s policy to prioritize stability and sustainable growth. Dinh The Hien, a finance expert, also thinks the policy of tightening credit will continue in 2019 with restriction of loans to the real estate sector. Regarding the interest rate, Hien does not think the interest rate will rise sharply. Though banks are offering relatively high interest rates for deposits, the interest rates will go down in some days. Meanwhile, Nguyen Tri Hieu, a respected banking expert, remains cautious about the business performance of the banking sector in 2019. He said the banks’ profit in 2019 will not be extremely optimistic because banks are still facing challenges, especially in capital increase and bad debt settlements, which will push costs up.